Are reverse auctions the best way to procure marketing services? Managing Director Martin Brass discusses what a reverse auction is, and whether it truly is a good way for healthcare companies to drive efficiencies when procuring marketing services. Many years ago I was invited by a friend, who was working at PWC at the time, to a demo of an innovation in enterprise purchasing technology. I have to be honest that at the time, Fred Bassett and I were working with Robbie Williams and his managers developing a new strategy and business model for music artists, so this invitation wasn’t exactly “rock and roll”. Nonetheless, I decided to attend. What I experienced that day was a reverse auction. Fast forward 13 years. Blue Latitude Health is now a 70 person company with global and regional clients from some of the largest companies in the healthcare sector. These companies have developed very sophisticated procurement departments whose role is to purchase products and services in various categories at an optimal price. What is a reverse auction? Well, simply put, it is the same as an auction except that, instead of a group of buyers bidding up the price on an item, a group of vendors are bidding down the price. In a regular auction, the market value of an item is based on the highest price that a bidder is willing to pay for it. In a reverse auction, the value is decided by the lowest price that a vendor is willing to sell it for. Several weeks ago, I received an invitation from an agent of one of our clients to participate in an auction for market research services. On reading the small print I became aware that this was, in fact, a reverse auction. We had been selected as one of 20 or so companies to bid to become a preferred global partner for research services. What was being auctioned was our rate card. The two companies with the lowest average rate cards would be chosen to join their panel of vendors. I was intrigued enough to accept the invitation and complete the comprehensive RFI documentation that would qualify us in or out of the process. 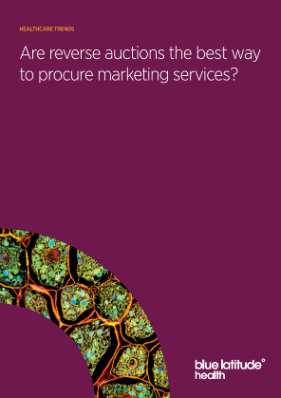 However, it made me question whether a reverse auction would actually work for the procurement of services at all. Sure, if you are buying a commodity, where the quality of the product is standard (or within a range) then a reverse auction will simply choose the most efficient vendor. If the vendor is efficient and has a high profit margin, then they can afford to sell their product for a lower price. But services are different, right? Services are performed by people who are experienced and expertly trained and the output, or ‘product’, is not standard, and in the case of research, is often unknown!